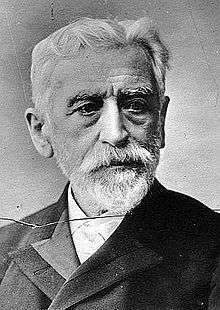 Eugenio Montero Ríos (13 November 1832 Santiago de Compostela – 12 May 1914 Madrid) was a leading member of the Spanish Liberal Party before being part of a 1903 schism that divided it. He also served briefly as Prime Minister. He played a role in the 1898 Treaty of Paris that ended the Spanish–American War as he was then President of the Senate of Spain. Wikimedia Commons has media related to Eugenio Montero Ríos.